Online Brigade Manager (OBM) is now “live” and available for you to start using. A good number of leaders jumped into OBM and have been setting things up and starting to make use of the system. In this article we share the key functionality OBM provides across all levels of the Brigade as well as hints and tips for getting started on OBM. – all registered leaders can access OBM, based on their role. OBM was developed originally for a UK based Scout Group (in the Scouting world they use ‘Online Scout Manager’) back in 2011. Over the last 5 years the system has been developed to also support groups across the world within Scouting and Guiding. OBM provides functionality across The Boys’ Brigade hierarchy, from local Companies to Battalions, Districts, Regional and UK & RoI Headquarters. with online and offline modes you can access on the web or through the app on your smartphone or tablet wherever you are. OBM is safe, secure, and a data protection act compliant system already being used by thousands of volunteer leaders in Scouting and Guiding across the globe. What does OBM deliver for your Company? manage young people’s personal details including contact details for parents/carers, medical details, etc. view and manage data for registered leaders in your Company including training (qualifications). record weekly attendance, link attendance to programme/badges. 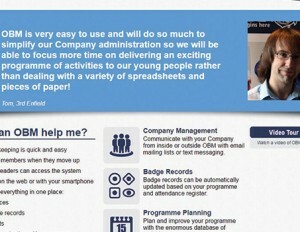 keep track of progress, manage badge stock and link badges to your programme and events. everything you need to manage events and camps/holidays including tracking attendance, making payments and more. when they move up a section or even move to a different Company. from inside or outside OBM with email mailing lists or text messaging. can access system through My.BB to sign-up to events, see badge progress, pay online, update details, see programme and access essential files/publications (e.g. consent forms). Ability to take online payments for subs and camps/events through the direct debits system which also incorporates gift aid management where applicable. record receipts and payments for events and activities making it easy to make expense claims or analyse costs. The Annual Statistical Return is fully integrated into the system. What does OBM deliver for your Battalion/District? access to search for leaders and Companies and view data within Battalion/District. ability to communicate electronically with leaders through OBM. the reporting framework enables data to be reported on (spreadsheet exports & graphical views). Information could help identify Company support needs, highlight trends, analyse membership/recruitment. To access OBM go to obm.boys-brigade.org.uk. If you are a Company Captain or Battalion/District Secretary a user account has already been setup for you so you can click on ‘Leaders Login’ button in the top right of the window and to get access first time around. You will need to use the ‘Forgotten Password’ link to reset your password, and from there on in you can just enter your username and password to login. All other Leaders will first need to register, by clicking on ‘Register’ from the top menu bar. After following the steps to register and setup a password leaders with no access at a Company/Battalion/District level will be able to view and update their own personal details. The structure is based on Sections. A typical Company will have been allocated with six Sections, Anchor Section, Junior Section, Company Section, Seniors, Company (including Leaders) and a Waiting List. Company Captains have been given access to all sections and are able to grant access to other registered leaders in your Company. OBM mirrors the hierarchy of the organisation. You will only be able to see information that relates to your Company, in the same way a Battalion can only access information for Companies and Leaders in their area. A ‘Getting Started’ guide for Companies has been produced outlining the initial steps to follow to get your Company up and running on OBM. You will also find videos, tutorials and FAQ’s to assist you in getting started and navigating the system. The details for registered leaders and information about Companies/Battalions/District has been transferred automatically from our previous database into OBM. It is possible that some of the information will be out of date or incomplete, so please check and amend where possible. If you spot something that is wrong that you cannot update yourself please let us know. It is important that you set up a record for each Young Person in the Company. This is a very simple process and only requires you to input basic information including name, date of birth, date joined and gender. If you currently keep spreadsheet records, the information can be imported directly into OBM in just seconds. This is the only aspect of OBM that must be completed by Companies, all other functions are optional, but we are confident you will want to adopt these because of the huge benefits they will bring. By 31st August 2016 you will need to set up records for each young person in the Company. Then between 1st September and 15th October 2016 (head count date for statistical return) any member that has left should be deleted and any new members added. From September 2016 when a young person joins the Company they must be added to OBM within 4 weeks. Equally if a young person leaves the Company they should be removed from OBM within 4 weeks, to ensure accurate records of membership are maintained. There is the potential for OBM to make a big difference to how we manage administration and communication in our Companies and across the wider Brigade. The functionality you see now is only the beginning, over the next five years we will be reviewing all of our processes and embedding as many of them as possible into this platform in order to save you time and to make our processes as straightforward as possible. We would welcome your feedback so we can ensure that future development is focussed around what you are telling us, and delivers the additional functions you would like to see. A number of webinars have been organised to assist you in getting started with OBM. Webinars are short web-based seminars, you can join a webinar from your own home, workplace or wherever is convenient for you, and all you need to take part is a computer with audio capability. The webinars are all interactive with the ability to give, receive and discuss information in real-time and are led by BB Headquarters staff. To register for the webinars logon to OBM and go to ‘Help’ menu and select ‘News & Announcements’.